Including C. fontanesiana of Michigan Flora. Along streams and river banks, borders of forests, shores, often on sandy hillsides, sometimes in wet ground; roadsides, fields, pastures. This is a distinctive species, once learned, with shiny leaves and often clearly layered, horizontal branching. The thorns are often 5–7 cm long and may be as long as 11.5 cm. 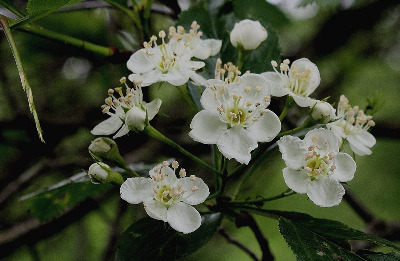 Plants referred to Crataegus disperma Ashe in Michigan Flora are ± intermediate in appearance between C. crus-galli and C. punctata, and are here considered of hybrid origin. MICHIGAN FLORA ONLINE. A. A. Reznicek, E. G. Voss, & B. S. Walters. February 2011. University of Michigan. Web. 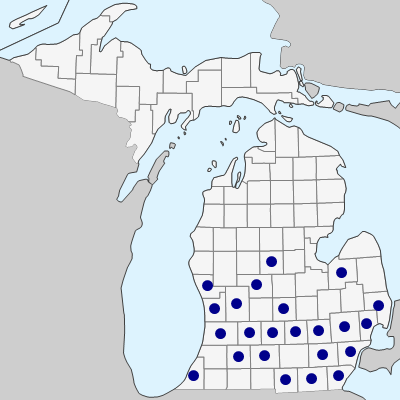 April 19, 2019. https://michiganflora.net/species.aspx?id=2442.